Shri Ram Navami is dedicated to the memory of Lord Rama, the legendary hero of the famous epic, The Ramayana. It occurs on the ninth day of Navaratre, (Navami). Celebrated enthusiastically all over India, the festival commemorates the birth of Rama who is remembered for his prosperous and righteous reign. Ram Rajya (the reign of Rama) has become synonymous with a period of peace and prosperity. He was an epitome of all that is good and true. Coincidentally, Anuj was also born on this auspicious day of Ram Navami in 1976. 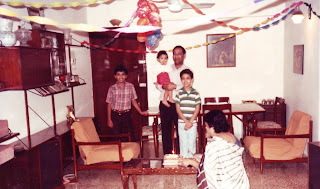 That year Ram Navami fell on April 9, Anuj's birthday. Anuj on his 8th Birthday. 1984. 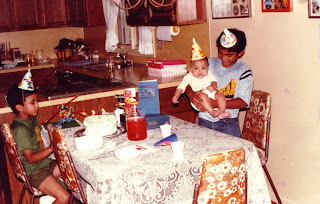 Anuj on his 12th Birthday. 1988. 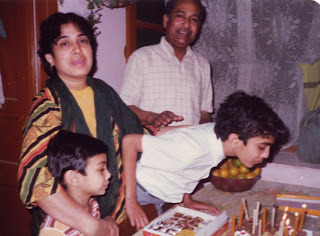 Anuj on his 9th Birthday. 1985. 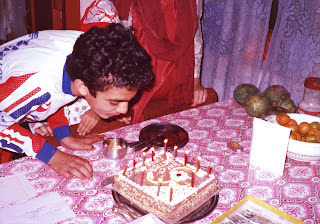 Anuj on his 11th Birthday. 1987. Anuj on his 10th Birthday. 1986. 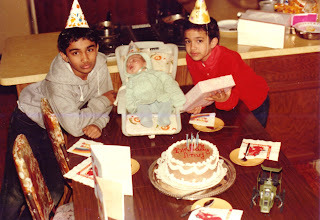 Anuj on his 13th Birthday. 1989. 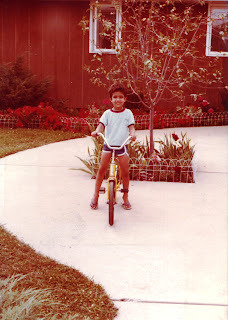 One of Anuj's greatest passions was his love for cycling. 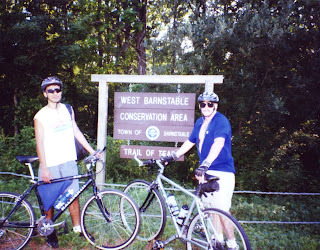 Be it a road trip from Boston to Cape Cod or a weekend excursion on one of the many bike routes in California, Anuj was ever-ready to put on his helmet and shoes and go for a ride. 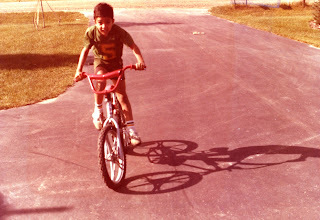 This affinity began at a very young age when he first learned how to ride a bike. 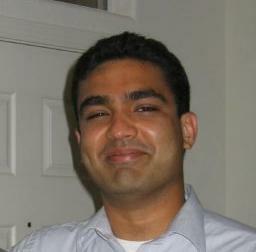 Anuj along with his brother Neal used to ride their dirt bikes around the neighborhood for hours after school. Later on when he joined MIT, Anuj and his fraternity brothers covered a 200-mile stretch from Boston to Cape Cod in a mere 2 days. His love for cycling only grew when he moved out to the west coast and discovered the numerous bike routes spread out all across the bay area. Anuj never missed out on a chance to ride on one of these routes. 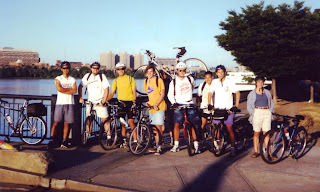 One of his dreams that unfortunately never materialised was to bike for fundraising cycling excursions, from San Francisco to Los Angeles, where he could enjoy his passion while helping out the community. Anuj enjoying a ride along the block in Michigan. Summer 1983. Anuj posing for us on his new dirt bike. Summer 1982. Anuj making a pit stop on his way to Cape Cod. Spring 1996. Anuj along with his fraternity brothers on the Cape Cod trip. Spring 1996. One of the greatest sporting spectacles, the 2007 ICC WORLD CUP, kicked off in Trinidad, Jamaica over the weekend. As the fireworks lit the night sky and performers danced to welcome the 16 teams from all corners of the world, we were reminded of Anuj and how passionate he was about the game. One of his prized possessions was a cricket bat he bought during his childhood years. The official song for the World Cup this year is "The Game of Love and Unity" by Shaggy, Rupee and Faye-Ann Lyons, rightly chosen for an event that will be viewed in nearly 200 countries, as millions of fans root for their team to lift the coveted prize. A true lover of the game himself, Anuj not only followed cricket with great interest, but was also a part of the School Cricket Team in his junior and senior years of high school, where he won several awards for his exceptional batting. 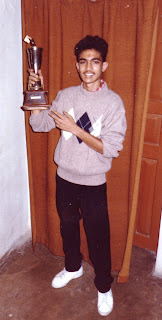 Anuj holding the trophy his team received for winning a Cricket Tournament at St. Francis College. Fall 1992. The colorful festival of Holi has an ancient origin and is celebrated as the triumph of good over evil. It also bridges the social gap and renews sweet relationships. Holi is a harvest celebration marking the climax of spring. Bonfires are lit the night before, following which, people have fun by throwing colored powder and colorful water, dancing and wishing each other well by giving a hug. 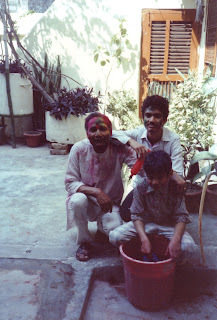 Holi was undoubtedly one of Anuj’s favorite festivals. 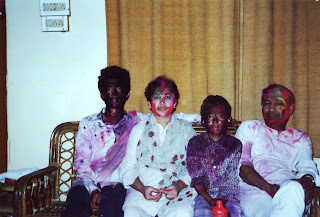 Holi was always a big tradition in our family. 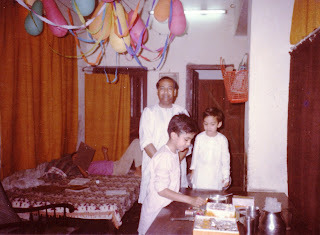 Festivities began days in advance where the house was decorated, Pujas were performed and most importantly sweets and playing colors were bought. 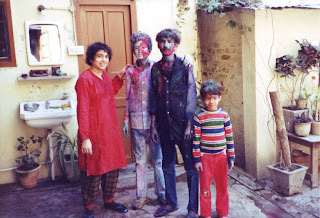 On the actual day of Holi, Anuj used to wake up early to fill his water gun with all sorts of colored water and be prepared for the festivities. As the tradition goes, people go from house to house wishing and greeting each other “Happy Holi” while putting color on each other and sharing sweets. Anuj always being full of joy and enthusiasm did the same as he went around with Neal and his friends playing Holi for hours. By the end of the day he used to always be drenched in colored water, have his face painted in an array of colors and already finished nearly a dozen sweets. Anuj loved playing Holi and sharing the love and happiness that the festival is a celebration of. 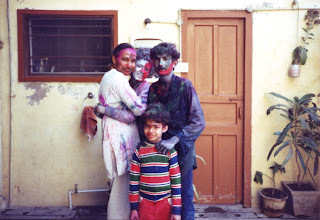 Below are a few images of Anuj along with the family during the many Holis celebrated in India.